The Christian Church (Disciples of Christ) is a mainline Protestant Christian denomination in North America. It is often referred to as The Christian Church, The Disciples of Christ, or more simply as The Disciples. The Christian Church was a charter participant in the formation of both the World Council of Churches and the Federal Council of Churches (now the National Council of Churches), and it continues to be engaged in ecumenical conversations. As an integral part of worship in most Christian Church (Disciples of Christ) congregations members celebrate the Lord's Supper. Most congregations also sing hymns, read from the Old and New Testaments of Christian Scripture, hear the word of God proclaimed through sermon or other medium and extend an invitation to become Christ's Disciples. As a congregational church, each congregation determines the nature of its worship, study, Christian service, and witness to the world. At the Lord's table, individuals are invited to acknowledge their faults and sins, to remember the death and resurrection of Jesus Christ, to remember their baptism, and to give thanks for God's redeeming love. The Christian Church (Disciples of Christ) believes that it is in the local congregations where people come, find, and know God as they gather in Christ's name. Because Disciples believe that the invitation to the table comes from Jesus Christ, communion is open to all who confess that Jesus Christ is Lord, regardless of their denominational affiliation. and obedience to him in all things. . ."
Congregations of the Christian Church are self-governing in the tradition of congregational polity. They select their own leadership, own their own property, and manage their own affairs. In Disciples congregations, the priesthood of all believers finds its expression in worship and Christian service. 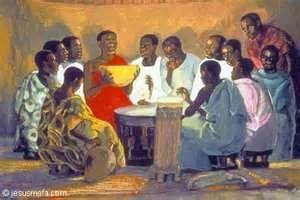 Typically, Lay Elders, rather than ordained ministers, preside at the Lord's Table in celebration of Communion. The lay Elders and called Pastors provide spiritual oversight and care for members in partnership with one another. The Regional Churches of the Christian Church provide resources for leadership development and opportunities for Christian fellowship beyond the local congregation. They have taken responsibility for the nurture and support of those individuals seeking to discern God’s call to service as ordained or licensed ministers. Typically, they organize summer camping experiences for children and youth. The Christian Church (Disciples of Christ) at the “General Church” level consists of a number of self-governing agencies, which focus upon specific Christian witnesses to the world that have emerged in the dialog within the movement since before the first convention in 1849. Typically, these ministries have a scope that is larger than Regional Ministries, and often have a global perspective. The church agencies report to the General Assembly, which meets biennially in odd numbered years. The General Minister and President (GMP) is the designated leader for the General Church, but does not have the administrative authority to direct any of the general church agencies other than “The Office of General Minister and President.” The GMP has influence that derives from the respect of the church much as the pastor of a local church leads a local congregation.